Cool report. Wonder if LITO went with. sweet, thanks for the link. They get buried quickly in advrider. As Ian the Owner of the HP2 said, ?I like bikes and I?m not a rabid pro anything guy. I just like to ride and at the moment it is the HP2? It carried more weight as he is in the fortunate position to be able to buy any bike he wants. 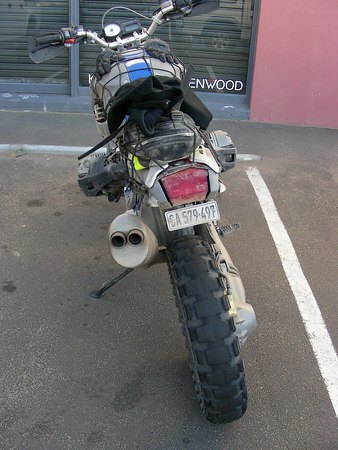 He has owned a GS adventure and a KTM 950. He would not be drawn into choosing one over the other, for him it is about riding. My observations was that it has crappy fuel range, 100 or so kays and that?s it. But then it was not designed to do mega distances. It is small and feels nimble, more so than the KTM. It completely ate a TKC80 in one weekend so it does not lack for power. He smoked on the long enduro track and overall had a great time. Just what biking is supposed to be. It is a credit to the owner that there was little if any snootiness from either side, and he won a prize in the end. Lito wasn't in on the trip unfortunately. Kamanya, I hope you will visit here more. Please! O ja, and bring some friends. Who says they want to ride with him? but hey! will check out that report. cant wait. heard of the loxton trip, was thinking about going, till the 950 ate the pirelli through and had to detour to pe. ah! i am persona non grata to KTM Western Cape cos I bought a grey market bike. So the BMW guys dont like you and the KTM guys are the same. At least the 6ft blonde is keen to go for a spin. Hijack on - Called off , I now have a fiance. She said yes. I now have a fiance. She said yes. what? did you mean finance? if this is not a typo then CONGRATULATIONS!! And Shark you are right. KTM private guys will ride, but not the KTM shop. Turns out I have met the leader of that KTM ride, Neville. Didnt know he had gone for the Dakar. Cool!